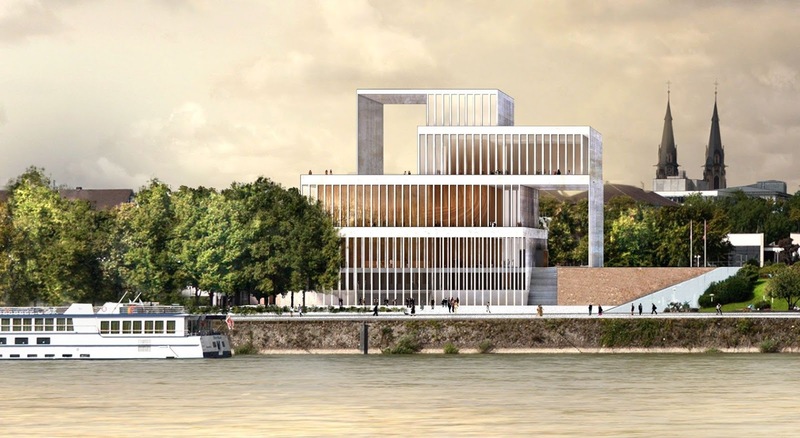 To mark the 250th anniversary of Ludwig van Beethoven’s birth, a new festival hall is to be built in his hometown of Bonn. 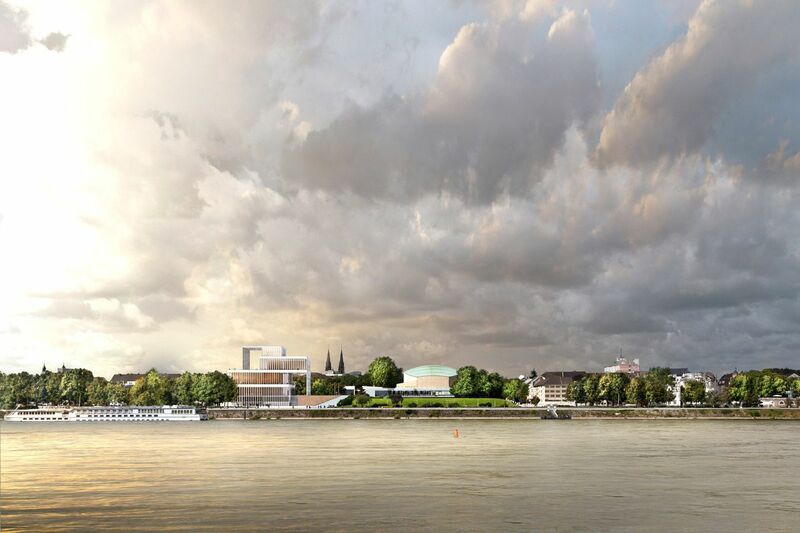 The new ‘Beethoven Festspielhaus’ will be situated on the banks of the River Rhine, close to the existing concert hall, the ‘Beethovenhalle’. The site was occupied by defence walls and towers in the Middle Ages, providing protection for the city. Evocative of this, the Festspielhaus provides a new high vantage point in Bonn. The new building is composed of four stacked volumes. 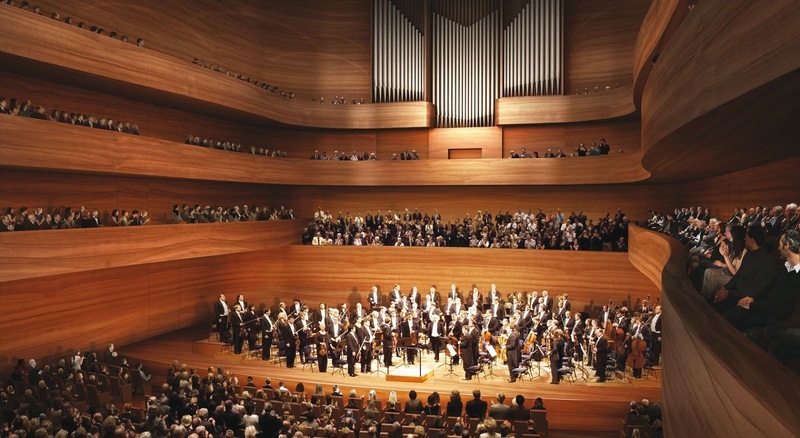 The placement of the two lower volumes, whose combined height is aligned with the eaves of the town, mediates between the river promenade and the raised gardens of the Beethovenhalle. 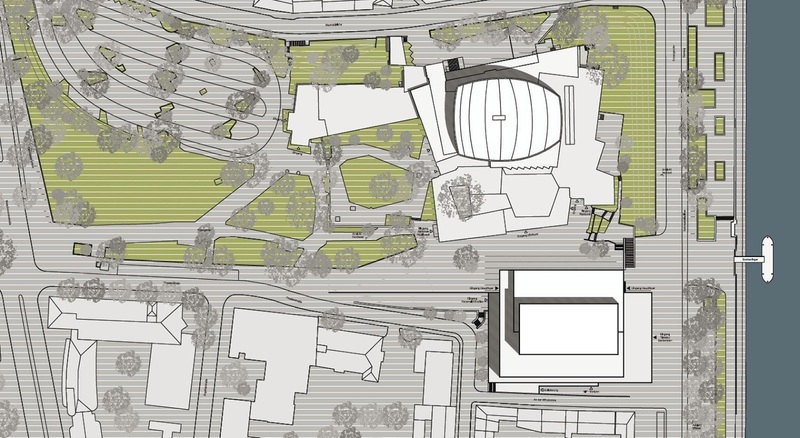 Main entrances are located on both levels, while a new square links the Beethoven-halle and the Festspielhaus. The top two volumes are shifted more towards the Beethovenhalle. They rise up to create a belvedere, providing views of the old town as well as over the Rhine towards the Siebengebirge, a range of hills to the southeast of Bonn. Accessible roof terraces and loggias expand the space to the outside. 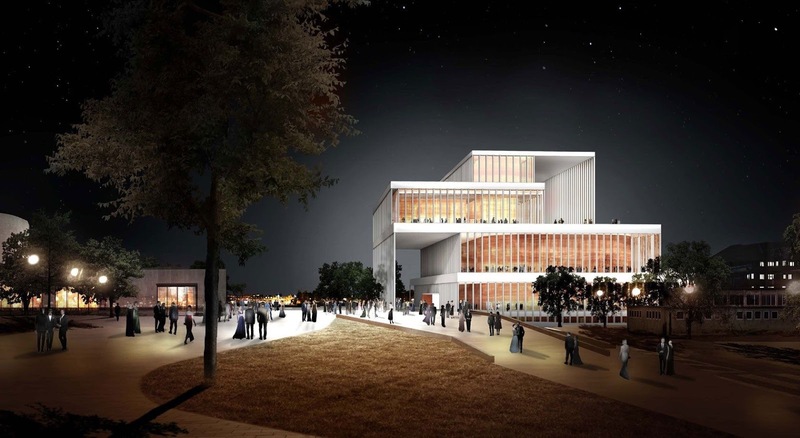 The volumes have a sculptural quality, which is accentuated by the reduced, transparent building exterior. Slim, white concrete pillars in front of a glass façade seem to merely veil the view into the interior. In the heart of the Festspielhaus, the curved exterior wall of the multi-purpose hall itself becomes apparent. The acoustic concept is based on the principle of a classic rectangular space which is gently enveloped by the surrounding, curved galleries. Completely clad in a richly grained walnut veneer, the multi-purpose hall conveys a warm, festive and focussed atmosphere. A storey with spectacular views is located one floor above. This floor can be used separately from the remaining building as an additional venue and also accommodates a restaurant and a sheltered exterior venue.